This identity theft awareness website offers hundreds of FREE and original identity theft management articles which are accessed by thousands of monthly global readers through various access points including an active identity theft newsletter and an identity theft blog. These identity protection articles discuss the latest identity theft threats, identity theft solutions and best identity theft protection strategies. Many businesses take advantage of free identity protection services offered by this site by referring their customers, employees and business partners to selected identity and access management articles to reduce their operating costs associated with education, training, and fraud prevention. The original identity theft articles for this progressive and unique identity theft awareness web site are written by identity theft experts at Identity Management Institute which is a leading identity risk management organization with global members. These identity management articles specifically raise identity theft awareness, and discuss strategies for identity theft prevention, identity theft monitoring, fraud detection, and fraud solutions for identity theft victims. Identity fraud is the fastest growing crime which affects millions of identity theft victims each year and results in billions of dollars in fraud losses for consumers, businesses and financial institutions. The underlying cause for the acceleration of this crime is attributed to the Internet, lack of awareness, and rising level of identity obesity which is the excess accumulation, retention and sharing of personal information by consumers and businesses. The lack of general public's awareness of identity theft risks and knowledge of best identity protection practices is a major contributor to the rising identity theft crime as people continue to mismanage their personal information. An identity is the foundation of one’s life, unique to each person, and defines who people are in the society. It consists of many components which, if not properly managed, could lead to identity theft fraud, resulting in financial losses, credit problems, security compromise at the workplace, and non-compliance with Federal and State privacy and information security laws among other things. It takes years to build one’s identity, but it could be destroyed very quickly if mishandled by anyone. To some extent, individuals and businesses are responsible for and capable of protecting their identities or the personal information of their clients and employees. Whether you are affected by identity crime or just looking for information on how to protect your identity or the personal information of your loved ones, clients or employees, you have come to the best identity theft awareness website. The prevention techniques presented in this web site can be used to reduce the overall identity theft risk. Identity theft protection requires a change in behavior and thought process for properly managing personal information. Although you can never eliminate identity theft risks completely, you must take responsibility for the protection of the information you have been entrusted with and have control over, especially, when managing the personal information of your employees, employers and clients. This identity theft awareness site was developed to help you do just that. Many of the identity theft awareness information presented here are used by information security professionals to develop identity theft management strategies as well as identity theft awareness campaigns and education programs for their companies. Businesses can refer their employees, customers as well as their business partners to this identity theft awareness website for free identity theft solutions and information in order to reduce identity theft and related fraud or education costs. 6- Helps businesses a) develop appropriate identity protection strategies, training programs, policies and procedures, and b) offer free identity theft awareness and training to their customers, employees and business partners with the information presented in the workplace information protection section and other relevant areas of the site. As you explore this identity theft awareness website, you will find other useful information such as updated resource links, various identity theft tests, and much more. As a starting point, you may select a test from the page below and determine your identity theft knowledge, risk level, and interest in identity management certifications offered by Identity Management Institute. We welcome your feedback, comments and questions through this form. Send us your site improvement suggestions or any other discussion topic related to identity theft. 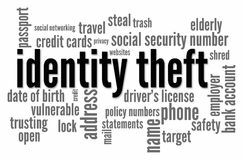 If you find the information on this site useful, please encourage others to subscribe to the Identity Theft Newsletter, and get the latest in identity theft resources, identity theft services, identity theft stories, fraud alerts and more. From time to time, career or personal risk management articles may also be posted for the interested readers. Thank you for visiting this site and we hope you benefit from the information presented here.